I’ve been away from the blog since Thanksgiving. It’s been a very busy holiday season here at the Beck house. We got ourselves a new puppy–Big Mo–whose been taking up a lot of my time. 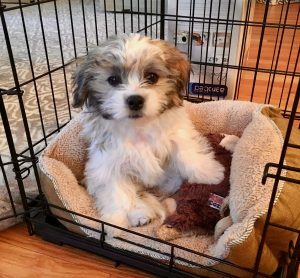 He’s a “Zuchon” (part Shih Tzu, part Bichon Frise) and adorable! We also enjoyed a white Christmas in Vermont with subzero temperatures. That weather kept up even in Connecticut, where I’ve been drinking plenty of hot chocolate to keep warm. But not even the freezing weather can keep me from embracing 2018. My word for the year is “balance” and I hope to achieve that through discipline. I bought myself a cheap, old-fashioned planner to map out my schedule and to-do list. I’m trying to exercise. Still working on that healthy eating (the holiday sweets overload has thrown me). But nine days in and I’d say I’m doing a B+ job of finding balance in my life. “I’m glad you approve, because we donated them.” He stared at her, hoping for her wide smile to emerge. The expansive, joyful smile that always filled him with heat and happiness. “Pounced is an exaggeration,” he defended. In June, we release the third Cabot book, WHEN YOU KNEW, and then I have a new series, The Sanctuary Sound novels, starting in October with the release of THE MEMORY OF YOU. I’d love for you to check some of these out. 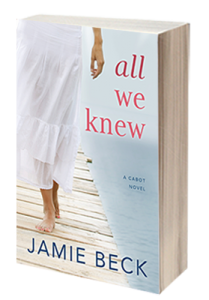 My publisher is running a giveaway of ALL WE KNEW on Goodreads, too, so sign up for a chance to win! I hope your new year is off to an excellent start, too. Happy reading!